Like it or not, this how a competent political party performs. For weeks, Congress appeared impervious to the #MeToo moment. As abusive men in media, entertainment, and even the culinary industry were swept from their perches, politicians held their ground. No more. Republicans and Democrats alike are compelling alleged abusers in their ranks to surrender their seats. There is, however, a distinction in how the two parties have handled allegations involving their members. While the GOP’s behavior has been thus far contradictory and chaotic, the Democrats have evinced striking discipline. Despite the Democratic Party’s election losses, it is the GOP that struggles with a leadership deficit — a feature that could make a world of difference in the upcoming midterm election in 2018. When it comes to allegations of intolerably boorish behavior in their ranks, Republicans do not speak with one voice. For some Republicans, that could be beneficial. It allows individual members to distance themselves from the party as a whole. That response contrasts significantly with Democrats, who have gone from reflexively defending their party’s accused abusers to throwing them overboard with gusto. Recently, Democrats have been shedding, albeit belatedly, the accused abusers in their midst and the hypocrisy that accompanied their instinct to rally the wagons around them. As indifference toward the #MeToo moment’s demands on Congress has given way to proactivity, Democrats have never stopped speaking with one voice on the matter. Franks is, however, being held to a far stricter standard than the one set for Rep. Blake Farenthold. The Republican Congressman came under renewed scrutiny recently following revelations that he settled a 2014 harassment suit by a former staffer to the tune of $84,000. Since then, another former staffer told the Houston Chronicle that Farenthold created an “emotionally damaging” work environment and made “inappropriate” comments in her presence. As of this writing, the only Republican calling for Farenthold to step down is Utah’s Rep. Mia Love. Of course, nothing so illustrates the dysfunction of the Republican Party in Washington as the fiasco involving Alabama Senate candidate Roy Moore. Following claims that Moore had repeatedly sought out romantic relationships with teenagers while he was serving as a district attorney in his thirties, including some who were underage, many elected Republicans insisted that he should drop out of the race. (Moore has denied the allegations.) The Republican Party’s committees withdrew their support. Even the White House insisted that Moore should bow out of the race provided the decade-old claims were substantiated. Predictably, they could not be. Trump soon personally backed Moore’s candidacy and the Republican National Committee also restored their support. On the other hand, not everyone in the GOP is so thrilled to welcome Moore. National Republican Senatorial Committee Chairman Sen. Cory Gardner averred that he and his committee will “never endorse” Moore and Republicans like Paul Ryan are standing by their demand for him to back out of the race. When it comes to the GOP and alleged sexual delinquents, chaos reigns. In other words, when it comes to the GOP and alleged sexual delinquents, chaos reigns. The contrast with the Democratic Party could not be starker. It hasn’t always been this way. For decades, the Democratic Party has stood by its alleged abusers so long as they were politically useful. 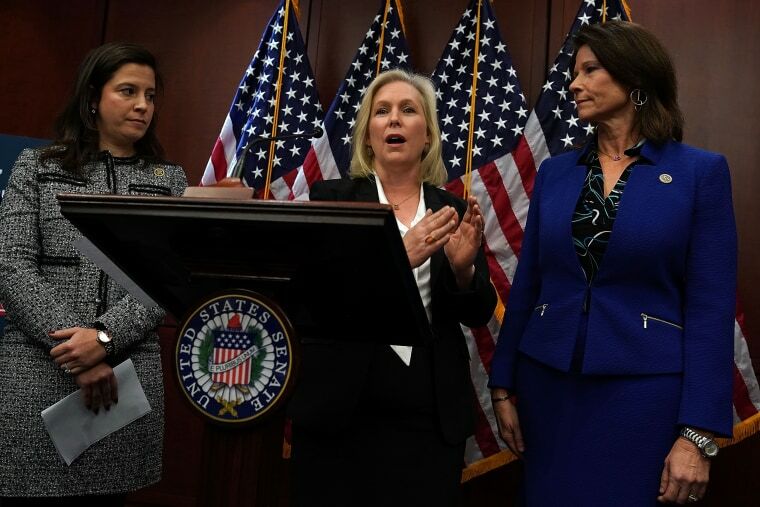 Only within the last several weeks have prominent Democrats, like Sen. Kirsten Gillibrand, and reliably liberal outlets like The New York Times editorial board mustered up the gumption to take the accusations against Bill Clinton seriously. It cannot be a coincidence that these concessions are offered only a year after the Clinton family’s political utility seems to have been entirely spent. The party is adapting, although not as quickly as some would like. Democrats in the House and Senate at first stayed quiet on both the allegations against Sen. Al Franken and Rep. John Conyers. Indeed, following allegations that Conyers had been accused of sexual improprieties by multiple women, including one accusation that resulted in a $27,000 settlement, House Minority Leader Nancy Pelosi’s first instinct was to draw fire for her embattled caucus member, calling him an “icon.” Rep. James Clyburn was similarly defensive. But then, four days later — just long enough to survey public opinion on the matter — the House Democratic caucus performed a total about-face. All at once, Pelosi, Clyburn and the rest of the Democratic House leadership conceded that it wasn’t enough for Conyers to surrender his position as the ranking member of the House Judiciary Committee. He had to go. Senator Franken was led to the chopping block a few days days later. The first wave of calls for Franken’s resignation came from women, followed closely by a series of men who agreed with their female counterparts. In this current moment of national reconciliation, the old tactics no longer work. According to reports, the wave of demands for Franken’s political head was coordinated. Senate Democratic women conferred in secret and agreed that all would hold hands and jump together. “Their patience had worn incredibly thin,” one unnamed Democratic aide told CNN. But patience with whom? Franken, or the Democratic leaders whose default position has for years been to circle the wagons. In this current moment of national reconciliation, those old tactics no longer work and Democrats may finally be coming to terms with this fact. For example, just hours after reports that Nevada Rep. Ruben Kihuen had behaved inappropriately surfaced on December 1, Pelosi publicly demanded his resignation. Kihuen responded by claiming that Pelosi was well aware of the allegations against him and had sat on them for over a year. Maybe that’s a Hail Mary pass by a politician trying to save his career, or maybe it is just another indication of how Democrats operated in the world before #MeToo. Ultimately, the Democrats have navigated the #MeToo moment as you would expect any competent political machine to operate. When it seemed like the party’s best recourse would be to circle the wagons and wait out the storm, that is what the party did. When that storm proved unavoidable, Democrats as a collective group changed course, tacked into the maelstrom, and cut their losses. Like it or not, and there are many Democrats who find these actions intolerably calculating, this is how a competent political party performs. By contrast, it’s clear now that there will be no coherent Republican message on just how much sexual harassment they’re prepared to tolerate. With the party led by a man who is himself accused of improper behavior by no fewer than 13 women — at last count — and appearing to have no interest in imposing discipline on the party he leads, the GOP is not well positioned to navigate the current political environment. And that could make all the difference next November.